The Pelton wheel is a water impulse turbine. The Pelton wheel extracts energy from the impulse of moving water, as opposed to its weight like traditional overshot water wheel. Pelton wheels are the preferred turbine for hydro-power, when the available water source has relatively high hydraulic head at low flow rates, where the Pelton wheel is most efficient. Thus, more power can be extracted from a water source with high-pressure and low-flow than from a source with low-pressure and high-flow, even when the two flows theoretically contain the same power. 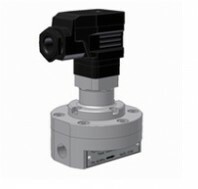 This appliance is suitable for small quantity and/or low pressure measuring. Primarily used this in fuel measurement.